How do you improve upon perfection? 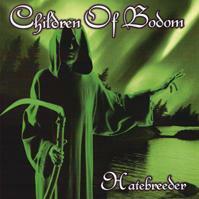 Ask Children of Bodom. Last year's Something Wild was like a thunderbolt of metallic brilliance, one of the highlights of the year. Believe it or not, Hatebreeder is even better. As one of the most musically proficient bands in metal, they've focused their energies and have managed to basically capture everything that is great about metal on one album. Death, Black Metal, Power Metal, Progressive, it's all here, and it's tremendous. This album has it all, spinning from brutality to melodicism effortlessly. The two guitars rip and tear at each other, throttling the listener with rhythms and harmonies. Meanwhile the keyboards blanket everything in godly melody. The drummer somehow manages to keep track of everything, and one must occasionally pause in awe at how in sync they are. The incredible vocals are done in what could be construed as a "black metal scream", but occasionally drift into a more melodic Taneli Jarva (old Sentenced) style, which is also excellent. The various guitar and keyboard solos are all done very tastefully, where on Something Wild they tended to border on self indulgence. Instead of simply layering the music with backing chords, like so many other keyboardists do, COB's keys are active in the melodic composition of each riff, often soloing. The guitar solos are ridiculously good as well. Despite the obvious individual virtuosity of the bandmembers, they manage to reel in their talent and focus it on these 9 spellbinding tracks. This is an early favorite of mine for album of the year. Get it.